Amazon will account for accounts for 49.1% of all online retail sales, up from 43% the year before, if they clear an expected $258 billion in sales this year. 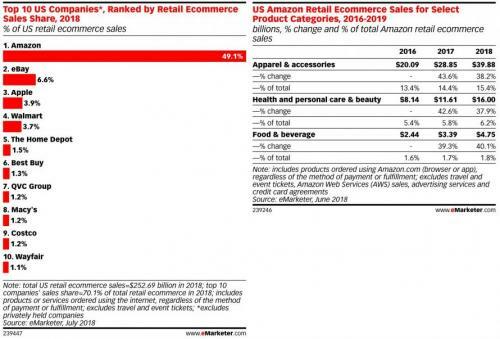 The stunning figure provided by research firm eMarketer is tempered by the fact that Amazon's near-majority share of online sales accounts for just 5% of all retail sales. Amazon is set to rake in $258.22 billion in US retail sales in 2018, while annual growth has jumped 29.2% year-over-year, reports Tech Crunch. Fueling Amazon's rise is a robust network of third-party sellers and a rapidly expanding range of goods from groceries to fashion - made all the more attractive for subscribers of their Prime services. The most popular category on Amazon is consumer electronics and tech, with projected sales of $65.82 billion according to eMarketer; around a quarter of total turnover. Second in line is apparel and accessories, which should account for roughly $39.88 billion, followed by health, personal care and beauty with $16 billion. In last place is food and beverage trailing at $4.75 billion. EMarketer arrives at their estimates "based on an analysis of quantitative and qualitative data from research firms, government agencies, media firms and public companies, plus interviews with top executives at publishers, ad buyers and agencies." 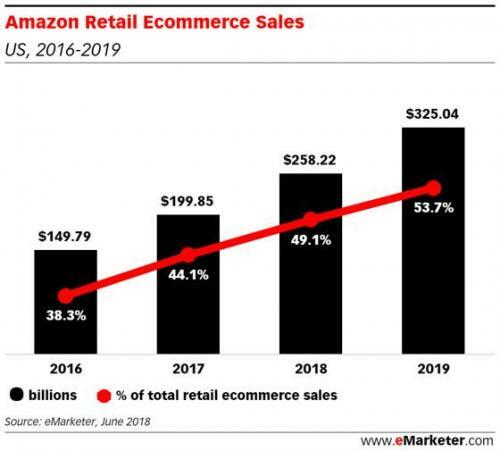 What's more, Amazon is expected to drive over 80% of ecommerce growth this year. By in large Amazon's largest cash cow is their Marketplace - a third-party sales platform on which sellers can use Amazon's retail and logistics infrastructure to hawk their wares. It currently accounts for 68% of all retail sales - or around $176 billion. Direct sales from Amazon comprise the remainder. Given that Amazon now accounts for roughly half of all online sales, one might think it's ripe for an antitrust investigation. That said, all of Amazon's sales only amount to five percent of all retail sales across the country.